About 99% finished with my Mutant Truckers article for NOD 12. 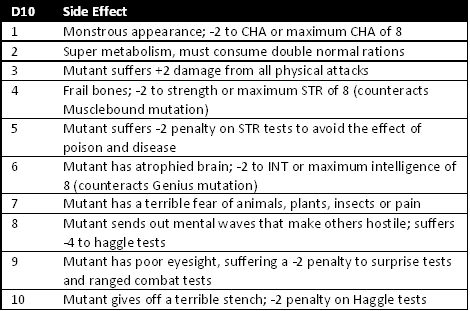 Thought I’d share the mutation tables to give folks an idea about just how mutant-y the game is. In general, Polyester Road doesn’t go as far down the mutant path as Gamma World and Mutant Future. Because it’s a mini-game/setting, I wanted to keep it focused and keep it from being too long. 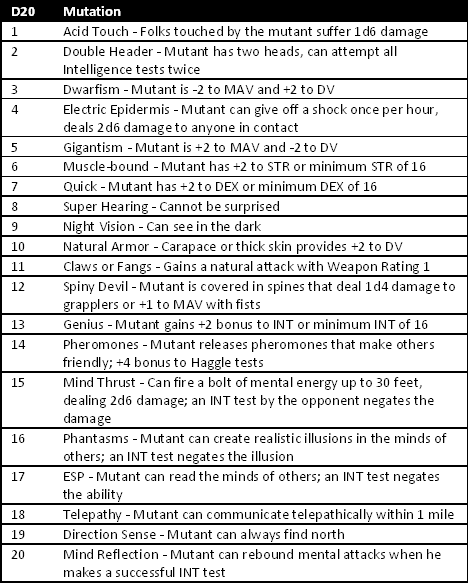 So, there is a small table of mutations – physical and mental, for folks to roll on. Characters can trade one hit dice for one mutation. Each mutation carries with it a 1 in 6 chance of a negative side effect (radioactive scrambled DNA can be dangerous, you know). Referees can use the same process to mutate monsters, bandits and bears (i.e. county mounties) – trade a hit dice for a random mutation. Hopefully, this will keep the mutations from dominating the game, but still allow for some fun variation of the characters. On a side note – I think the next big hex crawl in NOD will be Hell, based very loosely on Dante’s version, with a little Milton and lots of pulpy/gonzo nonsense thrown in for flavoring. The first hurdle will be mapping Hell – it’s circular and I have no idea how big it should be or what scale would work best. Still, should be an interesting exercise and provide readers with plenty of demonic and diabolical challenges for their game groups. Also gives me an excuse to use that devil cover I premiered a few months back! As a sucker for all things C.W. McCall, I'm off to order NOD #10!